The Fiery-shouldered Conures (Pyrrhura egregia) are endemic to the subtropical or tropical moist montanes of northeastern Brazil, southwestern Guyana and southern Venezuela. They are resident (non-migratory) within their range. Outside the breeding season, they are usually seen in noisy flocks of up to 20 individuals. When breeding, they usually remain in pairs or small family groups. When roosting, they are generally quiet and well hidden in the canopy, thus difficult to spot. However, their loud calls made in flight can easily be heard. They are most common in Tepuí (mountain) forests and forest edges; but may also wander to the bases of the mountains, and visit village gardens and parks. They occur at elevations from 2,300 - 5,900 feet (700 - 1,800 meters). They are at risk of extinction due to their limited distribution and destruction of their habitat in parts of their range, but their populations are still considered stable. Range: Highlands of southeastern/south central Venezuela, southwestern/western Guyana and northern Brazil. ID: The upper parts (back) is a darker green and the plumage below is slightly darker than those of the nominate form. They either lack the brown/red markings on the abdomen or they are smaller in size. 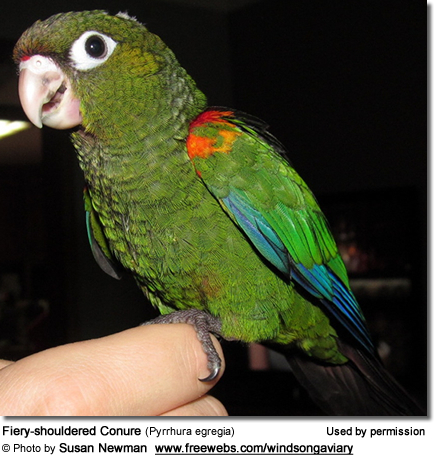 Fiery-shouldered Conures measure 9.8 - 10.6 inches (25 - 27 cm) in length (including the long, pointed tail) and weigh about 2.6 oz (75g). Their plumage is mostly green, except for the bright yellow-orange "shoulder" feathers (for which they were named) and lesser (inner / shorter) underwing feathers, green-edged brown feathers across the crown and lores (area between the bill and eyes), reddish-brown ear coverts (feathers covering the ears), and whitish-edged green feathers along the sides of the neck and chest, reddish-brown patch on the abdomen. The bill is horn colored. The eyes are brown and the eye rings are bare and white. Lack most of the bright markings of the adult, which grow in as they mature. There is less barring on the chest. In the wild, these conures will feed on the nectar, seeds, fruits and plant material of several tree species. 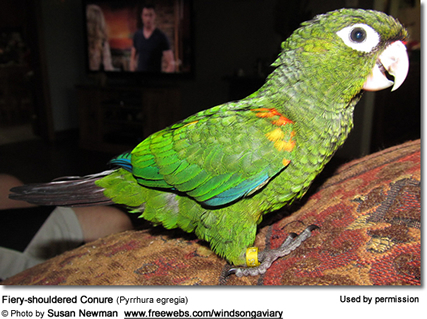 These conures generally move around in small, noisy flocks that are heard before they are seen. Their vocalizations are harsh, shrill and grating. Once they are settled in trees, they are typically silent and difficult to see. 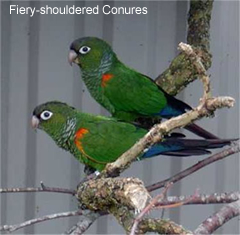 Fiery-shouldered Conures rapidly become confiding. They are smart, playful, mischievous and very sweet natured, with a gentle disposition. They are less noisy than other conure species (they are usually only heard when excited) and are less destructive than many of the other species. Within their natural range, most breeding occurs between March and June, where they generally nest in tree crevices. Below are the dimensions of nesting boxes usually used for these conures. However, the dimensions can vary widely, as they are influenced by the owner's and the birds' preferences. The preferences of the breeding birds can also be influenced by the size and type of nest-box / log in which the bird was hatched and reared. Czech: Papoušek rudoramenný ... Danish: Demeraraconure ... Finnish: Tepuinaratti ... French: Conure aile-de-feu, Perriche aile-de-feu, Perruche aile-de-feu, Perruche Gran Sabana ... German: Feuerbugsittich, Feuerbug-Sittich, Gran Sabana Sittich, Rotschwanzsittiche ... Italian: Conuro spallerosse, Parrocchetto spalleflammee ... Japanese: kishitabaurokoinko ... Dutch: Roodschouderparkiet, Gran Sabana Parkiet ... Norwegian: Demerera-conure, Guyanaparakitt, Ildvinget conure ... Polish: rudosterka rdzawoucha ... Portuguese: Tiriba-de-cauda-roxa ... Russian: ???????????? ????????????? ??????? ... Slovak: klinochvost podhorský ... Spanish: Cotorra Egregia, Perico de Cola Morada, Perico de Pantepui ... Swedish: Demerara conur, Eldskuldrad parakit Chinese: ???? ?